Freedom of the Will provides a novel interpretation of G. E. Moore’s famous conditional analysis of free will and discusses several questions about the meaning of free will and its significance for moral responsibility. Although Moore’ theory has a strong initial appeal, most metaphysicians believe that there are conclusive arguments against it. 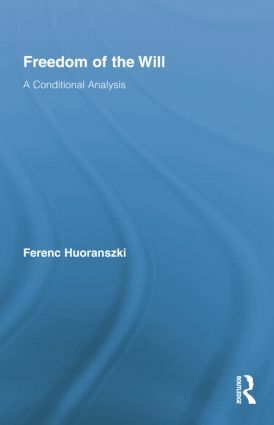 Huoranszki argues that the importance of conditional analysis must be reevaluated in light of some recent developments in the theory of dispositions. The original analysis can be amended so that the revised conditional account is not only a good response to determinist worries about the possibility of free will, but it can also explain the sense in which free will is an important condition of moral responsibility. This study addresses three fundamental issues about free will as a metaphysical condition of responsibility. First, the book explains why agents are responsible for their actions or omissions only if they have the ability to do otherwise and shows that the relevant ability is best captured by the revised conditional analysis. Second, it aims to clarify the relation between agents’ free will and their rational capacities. It argues that free will as a condition of responsibility must be understood in terms of agents’ ability to do otherwise rather than in terms of their capacity to respond to reasons. Finally, the book explains in which sense responsibility requires self-determination and argues that it is compatible with agents’ limited capacity to control their own character, reasons, and motives. Ferenc Huoranszki is Professor of Philosophy at Central European University, Philosophy Department. His main research areas include metaphysics and philosophy of action.